It has to be said that when guitarists, even those with years and years of band playing and gigging experience, decide to make a solo album featuring a set of self-composed instrumentals, the resulting project is likely to be distinctly underwhelming. It takes a vast amount of technical ability and compositional skill to hold a listener's attention over a whole album, but this is just what Pittsburgh-based Brady Novotny has done. And the fact that Brady has achieved this with his debut album 'Passions Collide' is nothing short of remarkable. The breath-taking musicality of 'Passions Collide' was best summed up by reviewer Scott Carlito on the Indie Band Guru website. Carlito wrote, "'Passions Collide' draws to a close with the aptly titled 'Midnight Prayer,' which immaculately discloses one final musical message of ominousness before instantly dematerializing and leaving a void of suffocating silence behind. Brady Novotny isn't a household name, nor has he been nominated for any Grammy Awards or trended on any social media sites, but he plays like a living legend in this LP, which is produced with close attention to the most subtle of details and boasts more creative content than most pop records twice its size tend to. 'Passions Collide' is music for musicians and those who would seek to even fathom their relationship with this powerful strain of electrified art." Brady Novotny started playing the guitar at the age of 10. Determined to be a world class guitarist, he left his first guitar lesson with his instructor telling him basically to give it up now. Thus he was introduced to criticism and disappointment early in his endeavour. Nevertheless, Brady heard a guitar player that would motivate him to push all that aside and re-energize his passion to continue; that guitar player was Randy Rhoads. Brady soon fell in love with classical and melodic guitar playing. Brady practiced restlessly learning everything from classical pieces, melodic and virtuosic solos from '80s guitar heroes, to jazz fusion. Novotny attended Berklee College Of Music, in Boston, Massachusetts, for a little time. Then at the age of 19, he was asked to teach summer guitar workshop at Duquesne University. As life often happens, however, Brady got burned out and went back to school and received his Masters in Psychology. Brady, though, never lost his passion for music-making. In the coming years, he took every opportunity to play in a number of bands proliferating in the Pittsburgh rock scene. 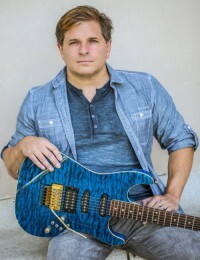 He also worked as a Pittsburgh session guitarist, worship leader and guitarist at several megachurches and also found time to teach guitar at clinics and universities. Finally, in 2017, Brady began to pull together compositions which were to form the basis of 'Passions Collide'. When it was released at the end of 2018, it was met with highly positive reviews. Enthused Indie Band Guru, "That Spanish-flavoured melody that sensuously winks at us in the first song re-joins the party at centre stage in 'Cara Bella', setting us up for the virginal vocal track 'Redemption's Cry' perfectly. 'Redemption's Cry' is a much more elegiac, sombre piece of music than the triplet of sonic fire-starters that get us rolling, but it doesn't interrupt the flow of the music at all. The bluesy wallop in 'Heart's Fire' wouldn't appear, at least on paper, as a smart way to shift gears following the emotion of its predecessor, but when you've got the galloping grooves that it has, you don't really need much of an introduction. 'The Journey Home' cleanses our palate with some understated rhythms that eventually shape a tour de force solo, but 'Passions Collide' is far from through with us yet. "'A Classical Prelude' takes us back in time with a historical folk guitar performance that is as abstractly arranged as it is gripping and stoically produced. There's no bells and whistles, but to be fair, this music doesn't need any (these melodies do everything that added fluff would be required to compensate for in a more amateurish record). 'Blue Rose' is the climax of the furious facets of flamenco, but next to the bristling 'Soul Harmony' it feels more like a stage setter for the real conclusion of the album. The first time I heard 'Passions Collide', I couldn't decide whether it was more indebted to classical music or something decidedly modern and hybrid-inspired. I ultimately determined that it vaults between both camps, or comes as close as you could get on a single LP." In an interview with Vents magazine, Brady admitted that his passion for live concerts is as strong as his passion for recording. He said, "The best thing about playing live is connecting with the people through the music; it's great to watch people disconnect from the stress in their lives and find what they need in the music." We can but hope that one day music lovers in Germany (Christian Rock Night) or Britain (Big Church Day Out) will get to hear this stunning musician. He really is something very, very special.